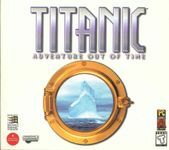 Titanic: Adventure Out of Time is a computer game developed by Cyberflix. It was published in Europe and the United States by Europress and GTE Entertainment respectively, released on October 31, 1996. The game is a point and click adventure game which sees the player traveling around a virtual representation of the RMS Titanic. Source: Wikipedia, Titanic: Adventure Out of Time , available under the CC-BY-SA License.